ACEP is a nonprofit with a global membership of over 1,200 licensed mental health professionals and allied health practitioners. ACEP members are dedicated to exploring, developing, researching and applying energy psychology methods to alleviate human suffering, enhance human performance and access human potential. Energy psychology (EP) is a family of integrative approaches to psychotherapy, coaching and healthcare treatment rooted in mind-body healing traditions. 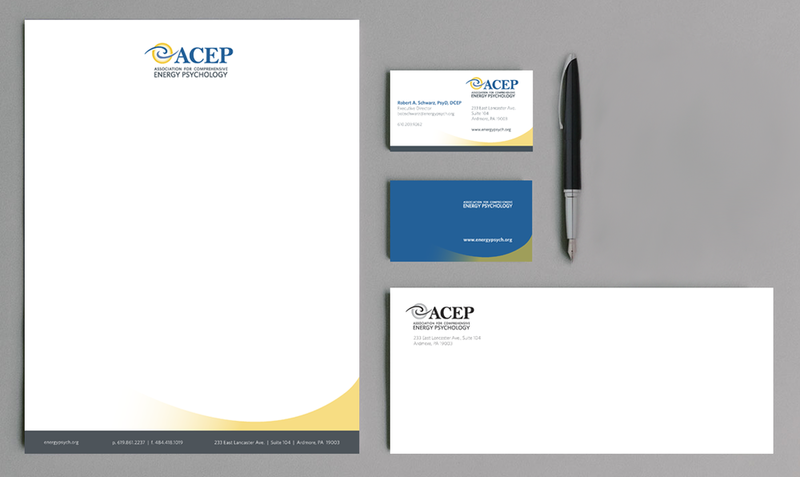 In order to grow their membership and engage more effectively with their audience, ACEP needed a new logo that conveyed the validity of the EP approach. They also needed their new logo applied to a stationery system. Our logo design for ACEP captures movement (energy) and uses the color blue to convey professionalism and legitimacy, which is vital since the field is not well understood by traditional health practitioners. The intertwined yellow and blue colors in the logo mark denote the integrated approach that is key to EP, as well as the mind-body connection. After designing their new logo, we then crafted a stationery system, which also employs a secondary brand element (a yellow swoosh).